On November 12, 2014, the Town of Fort Mill was awarded a $500,000 Community Development Block Grant (CDBG) through the SC Department of Commerce Grants Administration Office for neighborhood improvements in the Paradise neighborhood. This grant will go toward upgrades that include new sections of sidewalks on Steele Street, demolition of four vacant properties, two neighborhood signs, and water line improvements on Joe Louis and Steele Streets. In addition to the grant, the Town has agreed to contribute $68,076 toward the project which will go toward assisting with water line improvements, repaving and the clearing of an overgrown lot. York County C-Funds will also contribute $75,000 to the project for the repavement of Joe Louis Street after the water line is completed. 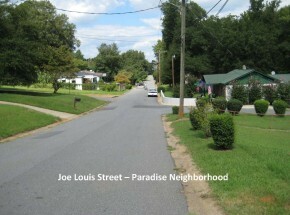 The Paradise neighborhood in Fort Mill is one of the Town’s oldest neighborhoods and plays an important role in the Town’s history.